Happy Monday everyone! Welcome to Muffin Tin Monday, the weekly blog carnival that celebrates the Muffin Tin Meal. To find out more, please visit the MTM faq page or visit previous MTM posts. This week there is no theme. We put a healthy spin on today's muffin tin lunch. I often will try and create a healthy balanced meal and the separated cups are a great tool for that purpose. Does anyone else's child eat fresh spinach leaves like their chips? No? Just mine then? Well, I count myself blessed and am wondering who's cloth she is cut from because spinach was (and dare I say is) the only veggie I absolutely will not eat unless it is in a dip or disguised in a salad. **Another Important Reminder** While I enjoy all of the submissions received each week, some participants have been posting bento box meals, Easy Lunchbox meals, and food served on a divided plate. 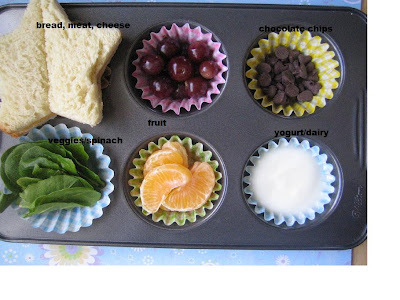 While this is sooo awesome and I know your kids are loving it, for our purposes here at muffintinmom.com, please only post meals in an actual muffin tin, cup, or paper liner. Please email me at vistamommy(at)yahoo(dot)com with any questions or see the faq page. Now, it's your turn! Did you make an Muffin TIn Meal? Won't you share it with us? Click on the link below! (Note, we are going back to Inlinkz thumbnail format. :) yay! Hee hee! I wouldn't say my daughter eats spinach leaves "like chips", but she will eat a few. Yours looks like a yummy tin. I'm sad there's not going to be weekly themes anymore though... :o( But I do understand it's probably a pain for you having to think of them all the time! The theme suggestion page sounds like a great idea - and I for one will be running with the "Colours of the Rainbow" theme starting next week, as I think it sounds awesome! What a great idea!! I am so excited to make one of these for my picky eater! I am going to miss the themes! Wish JDaniel would eat spinach. Oh, I'm going to miss themes. :( I like that idea for spinach chips. I am going to have to try that tomorrow. I'm sorry... I posted my pic before I read your request for no seperated plates. We will miss the challenge and inspiration that the themes provide each week, but we understand and look forward to all the creative ideas the moms will post on their own. Thanks for continuing to host this! My kid would eat spinach leaves and raw onions until he made himself sick if I'd let him. I'm a little late, well actually a whole day, lol, but I guess it's never to late for a Muffin Tin Meal. I have never tried Spinach leaves with my kids. I'll have to do that. Hi. Just discovered you and love your blog. What a great idea to serve meals in a muffin tin. I can't wait to try this with my three-year-old tomorrow. I think he'll go nuts! I love, love, love muffin tin meals. My kids love them, they enjoy eating their lunch out of them. But I've only used the theme once. I just am never that "together" to have it all put together and ready. So I usually put my muffin tin meals together on the fly and it never is a theme. The one time I did do it was so fun and the kids did love it but I just normally don't do it. I will plan on doing one tomorrow because it's Valentine's day but just because that happens to be the exact day and it seems to lend itself to it.